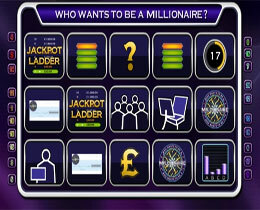 Who Wants to Be A Millionaire Slot is based on the popular TV quiz show which has been broadcast worldwide. The game has 5 Reels, 20 Paylines and Fun Bonus features. Fans of the show will find this game entertaining with excellent animations and matching music from the show. Lots of excitement, and a chance to become a millionaire!! Players get the opportunity of winning up to 15,000 times their total stake. Symbols in this game are related to the show, such as a symbol displaying the Question with the 4 alternative answers from which the contestant must choose an answer. There are also various symbols, such as showing the results of the audience poll, the recognizable Logo of the game show and the Cheque offered to the contestant. Because the game show originated in the UK, the Pound symbol also appears on the reels. By landing 3 or more Lifeline Scatter symbols the 10 free spins will be activated. During this Bonus round the Free spins can be retriggered. When the free spins end, a ‘Congratulations’ box will inform players how much they have won. Choice Bonus Round will be activated when hitting 3, 4 or 5 of the Player’s Choice symbols anywhere across the active pay lines. When 3, 4 or 5 boxes marked A to E appear, players must click on them to reveal the bonus prizes. In the game show the Jackpot Ladder traces the progress of the contestant. This Bonus will be triggered when landing 3 or more of the Jackpot Ladder symbols appear anywhere on the reels. Players are given 3 chances to climb up to the next rung to win the displayed prize. Should the player fail to climb up, a Lifeline will be lost. 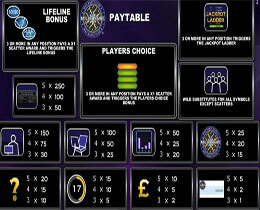 Should the player succeed, the Lifelines are restored and the winning value will be credited to the player's account. The Money Tree shows monetary values, from 100 to 1,000,000. This bonus offers free spins, triggered when 3 or more Lifeline symbols appear anywhere on the reels. These Llifelines appear as Fifty-Fifty, Audience Poll and Call-A-Friend. The Free Spins can be retriggered. This is an exciting game with many winning opportunities, fantastic payouts, and fun bonus games. Who Want’s to be a Millionaire is a realistic slot game where players get to feel the tension as if they’re in the hot seat, trying to win that million.